We’ve always pictured Scandinavia as the home of grisly crime fiction, weird pop music and IKEA. But it looks like there’s a growing custom scene too. Shops like the Wrenchmonkees and Unique Custom Cycles need no introduction. 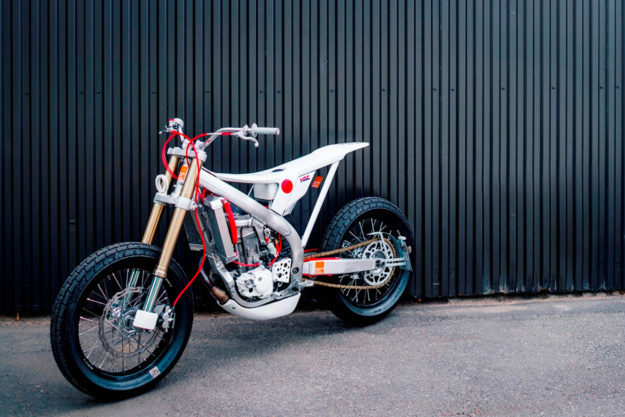 But straight after last week’s Norwegian Yamaha GTS comes this radical Honda tracker from Marcus Moto Design of Sweden. It has no seat, it’s painted in a vivid Arctic White, and it’s the custom equivalent of an ice-cold shot of Aquavit. 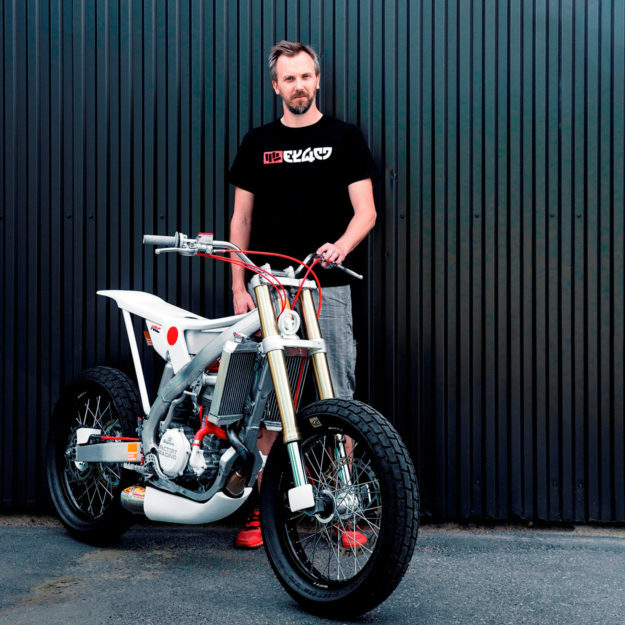 That’s fair enough—he builds his bikes in a small one-car garage, and has a full time job managing a team of 15 people for Ericsson. When his wife and 7-year-old twins are asleep at night, he sneaks into the garage to build. “I go in for a couple hours, and I basically just sleep less than them,” he says. 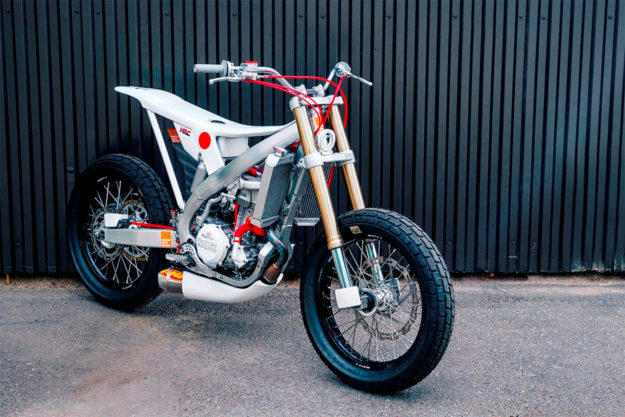 After the hiatus with the Aprilia, Marcus found a 2006-model Honda CRF450 that lived near his family’s summerhouse, out in the country. It was a much better base for his vision of the ultimate street tracker. 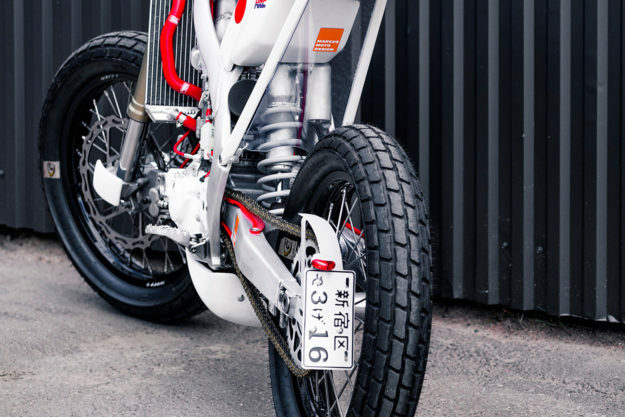 “Ultimate in my mind means minimal bodywork, centralized weight distribution, lightweight carbon fiber and a ‘concept motorcycle’ feel,” he says. 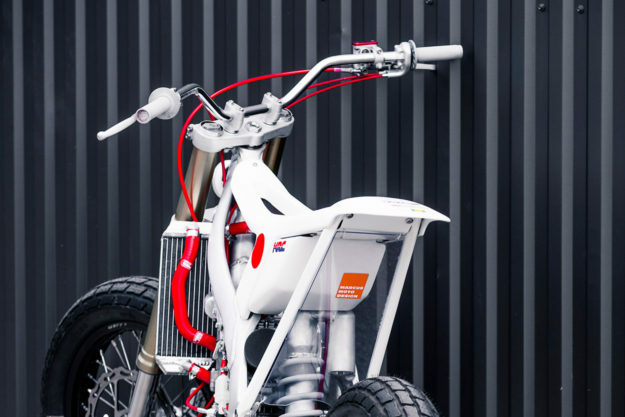 And with a modern aluminum motocross frame and a powerful four-stroke thumper engine, the CRF fitted the bill. Marcus might work slowly, but he does everything himself—even the paint. So he welded and modified the FMF exhaust, welded on the aluminum sub frame, and made the foam bases for the new bodywork. 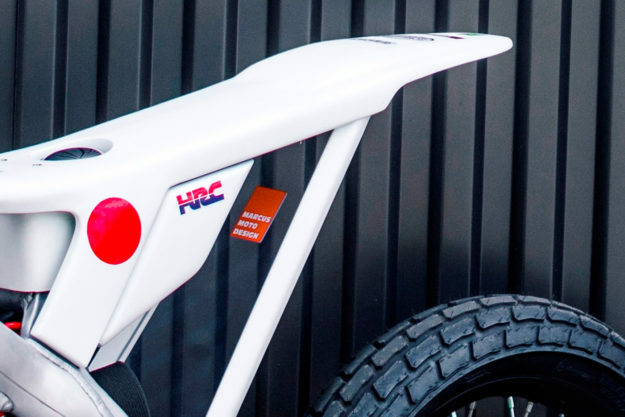 The gas tank, belly pan and remaining body panels were then hand-shaped with carbon fiber. Various other parts were designed in the CAD program NX, before being 3D printed. 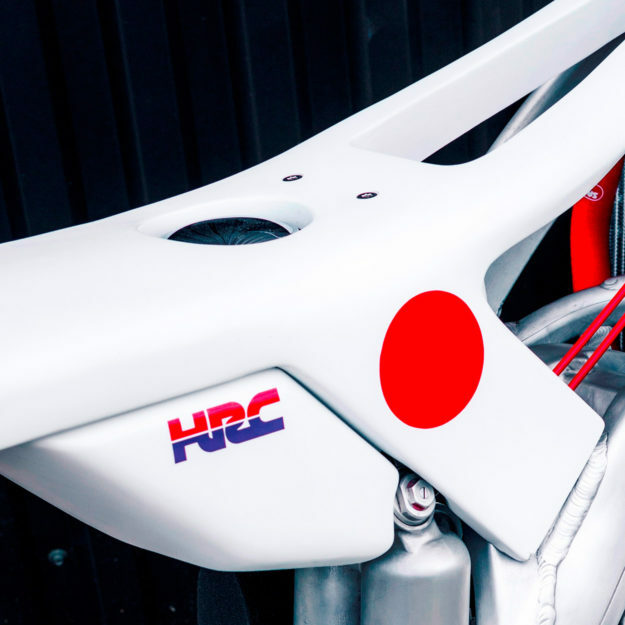 Marcus has lowered the forks for road use, but the frame and swing arm are stock: Honda motocross components are top quality. But everything else has been modified or simply removed, and the aluminum subframe does double duty as the mounting point for the gas tank. Indeed. We’re pretty sure the lighting will be inspected closely, for starters. At the front is an LED ring mounted on a 3D-printed bracket; further down is a tiny battery, hidden underneath the lower yoke. We’re pretty sure that’s another first in the custom world. 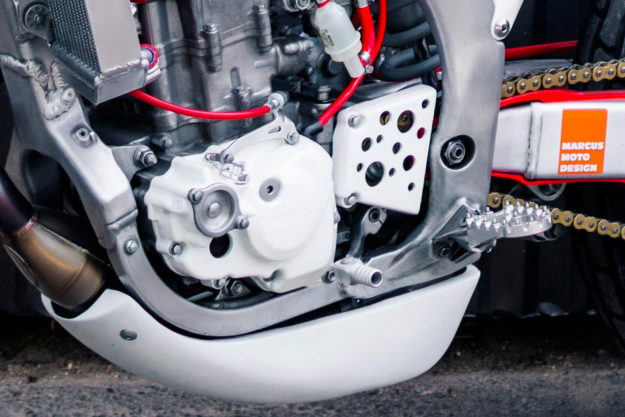 The tiny covers on either side of the front axle are also 3D printed, and there’s a matching aluminum cover for the rear brake caliper. 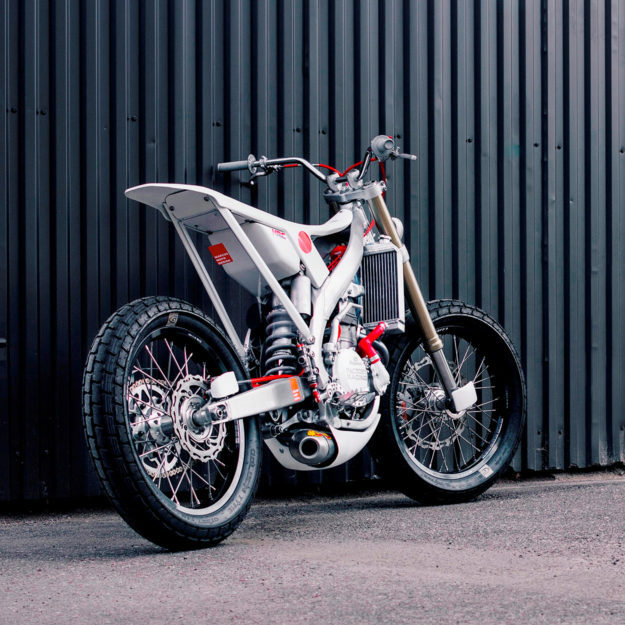 Both are designed to add a touch of sleekness and a ‘concept bike’ vibe. 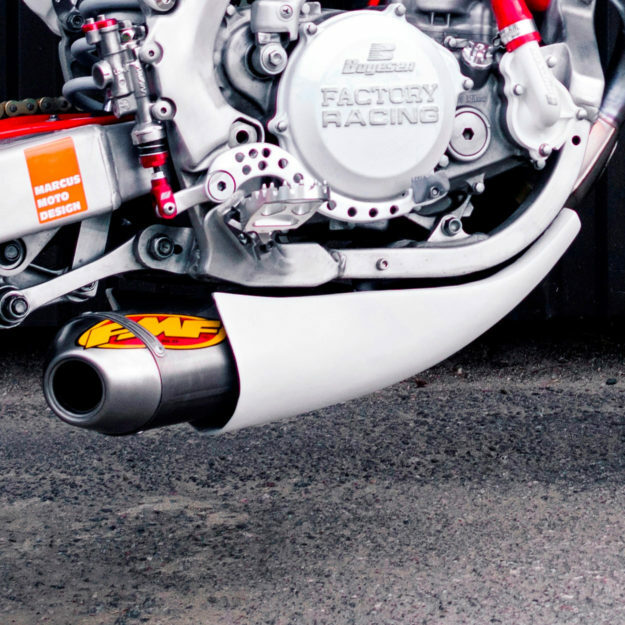 The modified FMF exhaust system has a shortened silencer, itself partially shielded from view. It’s tucked in underneath the engine, but the header length is standard to maximize power. An aftermarket radiator keeps the engine cool, hooked up with red Samco silicone hoses. To slow things down, there’s an oversized front brake—and the rear brake has been treated to a Fasst Co. spring kit for a smooth, easily modulated feel—ideal for road use. 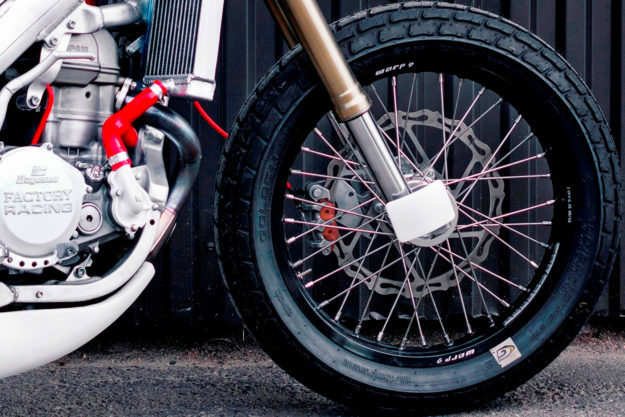 Those gorgeous wheels are one-off numbers from Warp 9, shod with Goldentyre flat track rubber. 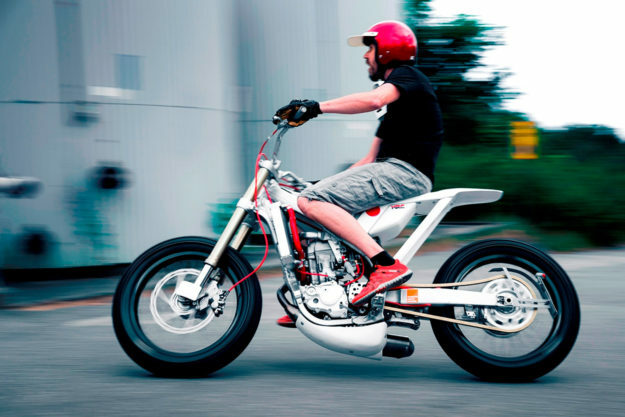 Yes, this is a barely street legal racer, right down to the battery-powered lights. It’s perfect for short stints on the curvy village roads outside Stockholm. We reckon the pint-sized phenomenon would have a ball on this machine. And he probably wouldn’t even miss the seat padding.